Just two weeks ago I left full time work to begin a new phase of working for myself, part time, and on a rolling schedule that includes exercise, writing, better eating, and…time to notice the little life dramas around me. Yesterday a swallowtail landed on my parsley plant, which has flowered on long stalks. She stayed there for several hours moving from flowering head to flowering head and glued an egg under many flowerlets. Over night these are now 1/8″ larvae who will devour the entire bush over several weeks becoming plump and long. When they’ve eaten it all up, they will find a place to suspend themselves and proceed to pupate. The dry cast looks dead but later on it will be empty. The new butterfly emerges and flits away. This occurred last year on the same bush. I thought I would have to replant the parsley but instead it came resoundingly back, seemingly refreshed, and lasted all fall and through the Florida winter. I have also noticed on the basil (grown from last year’s harvested seeds) a big beautiful bumblebee busily drinking from each little white bloom on the flowering stalks. I picked some shiny, broad basil leaves for my sister but the bee seemed unconcerned in his haste to drink it all. These little dramas in the lives of other species happened atop the Bay Oaks condominiums in my potted garden. Not only do I enjoy providing habitat for my fellow lifers but I love picking fresh herbs for meals. A neighbor suggested that I put fresh basil or rosemary in my iced water and Presto! I had a new refreshing drink. I wonder, would I have noticed these little life dramas had I been rushing to and from work; would they have happened while I was shut in a building with no ambient light or air? And leaves began to fly. “I must say good-bye.””I’ll stick my bottom to a stem. My skin is getting old. As snug and safe she lay. Her dry skin dropped away. And spread her wings to fly. Working on a new essay about Wakulla Springs I happened upon a series of the best natural and cultural history videos of the Wakulla Springs in Florida. 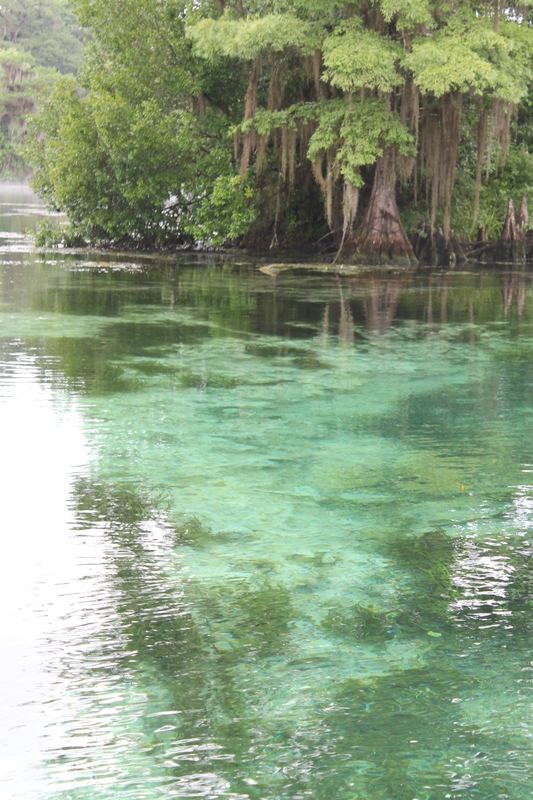 Wakulla Springs is one of the world’s largest artesian springs and part of an underground freshwater network underlying Florida. In these short videos you will learn about wildlife, the purchase of the springs and building of the famous lodge, the Hollywood movies, Army’s maneuvers there during the war years, and incredible views of wildlife–better than any I have seen before. Each of the 5 minute videos (habitat, bird life, development – includes incredible footage of the lodge fire, military maneuvers, and Hollywood films from Tarzan to The Creature from the Black Lagoon, to Airport 77, and archaeology of the springs, diving and underwater life)are superbly crafted. Staying at the Wakulla Springs Lodge is a true Florida experience.